I love you Leo Dried Peas for growing for us, in our garden, finally, in the middle of September, after a series of abandoned experiments, three Proper Pea Pods, each with two fresh peas. I love you Leo Dried Peas for being 65pence for 250 grams of said seed, really, and available at my local greengrocers as well as at the Co-op. Leo Dried Peas, if you please…. 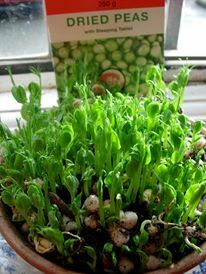 Sprouting the peas: a great nibble for a passer-by, and soon to grow into a proper pea-shoot. These are whole, dried peas? Available for eating? I don’t think we have those in the US. Only split peas. I’m jealous! Pea shoots are the best. Love to saute them in bacon grease and serve with fried eggs for breakfast. Mmmmmm. I think of them as “marrowfat” peas- whole dried peas that can begin the whole cycle of the pea again. I think of how the pea was a really important food for Northern Europe, and so true in Britain. Jane Grigson in her book Vegetable Cookery talks about how the ubiquity of the frozen pea has taken away our appreciation of the true special delicousness of the fresh pea… eating my fresh peas grown from this dried pea was, truly, an experience — very sweet and tender. In Britain, people really do eat “Mushy Peas,” especially but not only with Fish and Chips (maybe also with ham) — often comes in tins and is an incredible, lurid green. But made from boiled Marrotfat Peas (i.e. Leo’s Dried Peas for the brand-loyal) and … mushed! PS- I just read you can make wasabi peas from them– going to investigate. Oh please DO make wasabi peas from them as they are one of my absolute favourites and I don’t mind being your quality control taster! YUM! I want to try it! And the next one you can curry! Never thought to raise pea spouts during the winter months, thanks for the great idea – I shall definitely do this. I know the boxes well and, like you, love the way nobody has desired to redesign the packaging – it is a classic.